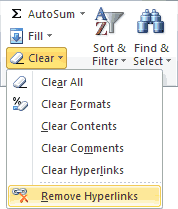 From the 'Editing' group on the Home tab of the Excel ribbon, select the option Clear → Remove Hyperlinks (see rightabove). Note that this command will remove the hyperlinks in the selected cell(s), but the formatting of the cell(s) will remain unchanged. Use the mouse to right-click on the selected cell(s) then, from the right-click menu, select the option Remove Hyperlink (or Remove Hyperlinks if you have more than one cell selected). This option removes the hyperlinks and the formatting from the selected cell(s). The Paste Special options dialog box will pop up. Select the option Multiply and click OK.
Close the VBA Editor (by clicking on the X in the top right of the window). 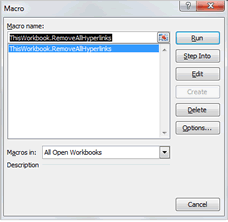 From the 'Macro' dialog box, select the macro ThisWorkbook.RemoveAllHyperlinks then click Run. 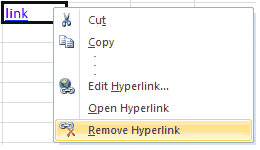 Warning: running this macro removes all hyperlinks in the worksheet permanently. You will not be able to use the undo command to return the hyperlinks to the worksheet.